BackgroundRecent years have seen a huge growth in the market of industrial yeasts with the need for strains affording better performance or to be used in new applications. Stress tolerance of commercial Saccharomyces cerevisiae yeasts is, without doubt, a trait that needs improving. Such trait is, however, complex, and therefore only in-depth knowledge of their biochemical, physiological and genetic principles can help us to define improvement strategies and to identify the key factors for strain selection.ResultsWe have determined the transcriptional response of commercial baker's yeast cells to both high-sucrose and lean dough by using DNA macroarrays and liquid dough (LD) model system. Cells from compressed yeast blocks display a reciprocal transcription program to that commonly reported for laboratory strains exposed to osmotic stress. This discrepancy likely reflects differences in strain background and/or experimental design. 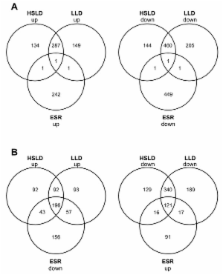 Quite remarkably, we also found that the transcriptional response of starved baker's yeast cells was qualitatively similar in the presence or absence of sucrose in the LD. Nevertheless, there was a set of differentially regulated genes, which might be relevant for cells to adapt to high osmolarity. Consistent with this, overexpression of CAF16 or ORC2, two transcriptional factor-encoding genes included in this group, had positive effects on leavening activity of baker's yeast. Moreover, these effects were more pronounced during freezing and frozen storage of high-sucrose LD.ConclusionsEngineering of differentially regulated genes opens the possibility to improve the physiological behavior of baker's yeast cells under stress conditions like those encountered in downstream applications. We explored genomic expression patterns in the yeast Saccharomyces cerevisiae responding to diverse environmental transitions. DNA microarrays were used to measure changes in transcript levels over time for almost every yeast gene, as cells responded to temperature shocks, hydrogen peroxide, the superoxide-generating drug menadione, the sulfhydryl-oxidizing agent diamide, the disulfide-reducing agent dithiothreitol, hyper- and hypo-osmotic shock, amino acid starvation, nitrogen source depletion, and progression into stationary phase. A large set of genes (approximately 900) showed a similar drastic response to almost all of these environmental changes. Additional features of the genomic responses were specialized for specific conditions. Promoter analysis and subsequent characterization of the responses of mutant strains implicated the transcription factors Yap1p, as well as Msn2p and Msn4p, in mediating specific features of the transcriptional response, while the identification of novel sequence elements provided clues to novel regulators. Physiological themes in the genomic responses to specific environmental stresses provided insights into the effects of those stresses on the cell. All tools in the DAVID Bioinformatics Resources aim to provide functional interpretation of large lists of genes derived from genomic studies. The newly updated DAVID Bioinformatics Resources consists of the DAVID Knowledgebase and five integrated, web-based functional annotation tool suites: the DAVID Gene Functional Classification Tool, the DAVID Functional Annotation Tool, the DAVID Gene ID Conversion Tool, the DAVID Gene Name Viewer and the DAVID NIAID Pathogen Genome Browser. The expanded DAVID Knowledgebase now integrates almost all major and well-known public bioinformatics resources centralized by the DAVID Gene Concept, a single-linkage method to agglomerate tens of millions of diverse gene/protein identifiers and annotation terms from a variety of public bioinformatics databases. For any uploaded gene list, the DAVID Resources now provides not only the typical gene-term enrichment analysis, but also new tools and functions that allow users to condense large gene lists into gene functional groups, convert between gene/protein identifiers, visualize many-genes-to-many-terms relationships, cluster redundant and heterogeneous terms into groups, search for interesting and related genes or terms, dynamically view genes from their lists on bio-pathways and more. With DAVID (http://david.niaid.nih.gov), investigators gain more power to interpret the biological mechanisms associated with large gene lists. Copyright statement: Copyright ©2010 Pérez-Torrado et al; licensee BioMed Central Ltd.
Chemostat-based micro-array analysis in baker's yeast. Expression quantitative trait locus mapping of toxoplasma genes reveals multiple mechanisms for strain-specific differences in gene expression.